How do you highlight the plight of Britain's millions of pensioners, many of whom are bored and lonely? Put them into a rock band and let their charisma speak for itself, says Tim Samuels, the creator of pop's most unlikely sensation - the Zimmers. Five international TV crews jostled for the best position as the black cab pulled up outside the BBC. The taxi door opened and the questions fired out: "How are you coping with the fame? ", "Is there going to an album?" "What's your next record going to be?" shouted one of the two South Korean TV crews who had turned up. Surrounded by camera and microphones, the person at the centre of the media scrum was an unfazed 99-year-old white-haired lady leaning on a walking stick. Just another day in Zimmermania. A few weeks ago Winnie, the 99-year-old, was mainly answering questions about what she wanted for her supper in the old people's home she lives at. Now it's whether she's planning on covering Oasis' Live Forever if there's an album. "Oh, I'm enjoying this very much" twinkles Winnie, before shuffling past the scrum into the TV studios. What's propelled Winnie into the midst of a global frenzy is being a member of The Zimmers - perhaps the most extraordinary pop sensation in town. The Zimmers are 40 lonely old people who have come together to cover The Who's "My Generation". Winnie isn't even the oldest in the band - Buster is 100. Lead singer Alf is a mere spring chicken at 90. The Zimmers may be a global sensation, but they started as a half-baked idea with humble ambitions. I set out to make a documentary which explored how we treat our old people in this country. For a long time I've thought that old people get a terrible deal. So many are just dumped in care homes, stuck at home on their own, and generally marginalised. If you can judge a society by how well it treats its old people, we'd be in trouble. But I wanted to actually do something which might have an impact, rather than just turning up, filming someone, reinforcing their "victim" status, then heading off. I wanted to highlight their marginalised status, then do something to help them fight back; something with a little bit of attitude and chutzpah. But what to do with lonely old people? It had increasingly struck me that old people just get swept under the carpet and out of sight. 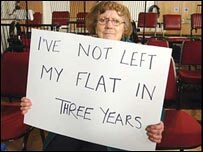 Whether it's the half a million living in care homes, or the 3.5 million living alone. We really wanted to make old people visible again - and push them right back into the heart of society. What better way than try and break them into the pop charts? And so The Zimmers began to take shape. I went up and down the country meeting marginalised old people and seeing if they'd be willing to have a go at making a single. Most thought it was a faintly ridiculous idea, but were willing to give it a go - it'd be a nice day out in London if nothing else. A few of them had even heard of The Who's My Generation - though Winnie did call it "The Generation Game." We ended up with 40 OAPs willing to sing - but still not the foggiest about how to turn them into chart-assaulting rockers. Salvation came from a couple of figures in the music industry who felt passionate about the cause. Mike Hedges - producer to U2, Dido and the Cure - agreed to make the single, and Neil Reed at X-Phonics took on the challenge of releasing it. Then Band Aid video director Geoff Wonfor got on board, and we even managed to blag the Beatles' studio at Abbey Road. So one magical afternoon, our "band" filled Abbey Road for their extraordinary version of My Generation. None had done anything like this before. These were old people bored in care homes, isolated living in high-rise tower-blocks and generally fed up with not being listened to. And then 90-year-old Alf stepped up to the mic and snarled "I hope I die before I get old" - and we knew we had something pretty special. But what happened next took us all by surprise, to say the least. The video of The Zimmers went on the internet, and within weeks had earned two million hits on YouTube [to see it, go to "internet links" above, right]. It became the number one featured video on the site. E-mails flooded in from around the world saying how inspirational the band were. There were interviews with media from more than 50 countries. One Brazilian show had 40 million viewers. Then, in true Calendar Girls fashion, the Zimmers flew off to take on America. They have touched a universal nerve. Every society has qualms about how its old people are treated, and takes heart from seeing a bunch of them come together in rock'n'roll fashion to make themselves heard. With luck, it will challenge a few preconceptions about old people. Mine have been changed. They've been a hilarious group to hang around with. Winnie, 99, is a constant source of rude jokes. She even penned her own "homo limerick" before going on the Graham Norton Show. I hadn't quite expected to become a pop svengali, some kind of geriatric Simon Cowell. But whatever happens to the band, at least it's changed the lives of some of those who have come along for the ride. After giving yet another interview to South Korean TV, Alf our lead singer, said: "It's just brought me back to life. I was 90 and stuck in a rut. And now I feel that I have come alive again." 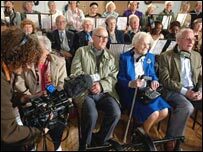 The Great Granny Chart Invasion will be broadcast on BBC Two at 2100 BST on Monday 28 May.